TORONTO -- They showed up wearing Maple Leafs blue, Flames red, Flyers orange and Stars green. One fan, wearing a Florida jersey, announced that she flew up from Fort Lauderdale to be here just to see two of her favorite former Panthers -- Joe Nieuwendyk and Ed Belfour. Like so many others on Sunday, she got to ask a question to a soon-to-be Hall of Famer. Like so many others on Sunday, she was thrilled just to get a response. The annual hour-long Fan Forum during Hockey Hall of Fame Weekend started in 2000 when Wayne Gretzky wanted to get up close and personal with the people who watched him from the time he was the next one to the time he became The Great One. The event has become a hit at the Hall of Fame ever since, and on Sunday morning Nieuwendyk, Belfour, Doug Gilmour and Mark Howe spent 60 minutes laughing with each other while telling stories, offering advice to children and rehashing the best moments of their careers. When did it hit you that this was for real, that you were going to be a member of the Hockey Hall of Fame? For Nieuwendyk, it wasn't until he walked onto the ice prior to Saturday's game between the Maple Leafs and Senators and shook hands with the 15 current members of the Hockey Hall of Fame that were there to honor the Class of 2011. "I've been in Dallas all this time, the last few months since they made the announcement, and you don't really feel it like you do here in Toronto," Nieuwendyk said. "Walking on that ice, seeing all those legends, shaking their hands and looking in their eyes, it kind of brought a tear to my eyes and it really hit home." Howe, who works for the Detroit Red Wings as a pro scout, mentioned that he made sure to get all of his work done in advance so he could take the time to properly enjoy the weekend. But, like Nieuwendyk, it wasn't until Saturday night when he thought about the wow factor. "I was the first one out by the faceoff circle, and the thought went through my head, 'Wow, this is really starting to feel like something.' The next thought was, 'I can not wait until (Monday),'" Howe said. "I am so looking forward to this. There is no better honor." What are your memories of playing in Toronto? Gilmour is a Maple Leafs legend. Belfour can still hear the chants of "Eddie, Eddie, Eddie" when he goes to bed at night. "I relished the challenge of trying to perform in an atmosphere like this," Belfour said. Nieuwendyk is a local boy from nearby Whitby, Ont. who lived out his dream of playing for his beloved Maple Leafs if only for one season. Howe got a chance to play with the Toronto Marlboros of the Ontario Hockey Association in 1972-73. "This was probably my favorite place to play even though I was here only four years," Belfour said. "I enjoyed the challenge of playing in front of the toughest media crowd. It's an awesome place and it would be the best place to win a Stanley Cup." What was it like crafting a career as the son of Gordie Howe? Mark Howe has never run from the moniker that will always be attached to him. "I will always be known as Gordie Howe's son," Mark said. "That's what I grew up with and I'm very proud of it." However, when Mark got to Philadelphia in 1982 a new opportunity presented itself. "When I got to Philadelphia it gave me an opportunity to try to become Mark Howe," he said. "People always referred to me as Gordie Howe's son, but I was recognized for being Mark Howe the player." Mark Howe, Gordie's son, went on to score 742 points in 929 NHL games. He played in four NHL All-Star Games and was a consistent candidate for the Norris Trophy despite never winning the award for the League's top defenseman. The Flyers gave him the chance to finally get out of his dad's shadows. "I was very fortunate in the fact that I played with so many quality, quality people like Dave Poulin, Brian Propp, my dear friend Brad McCrimmon," Mark said. "Unfortunately we never won a Stanley Cup, but I was proud to be a member of that team as any team I ever played on." Who was your favorite coach that you ever played for? Nieuwendyk won the Stanley Cup in 1989 with Terry Crisp, in 1999 with Ken Hitchcock and again in 2003 with Pat Burns. But, his favorite coach was a man from Whitby, Ont. by the name of Benny LaHaye, who passed away earlier this year at the age of 86. 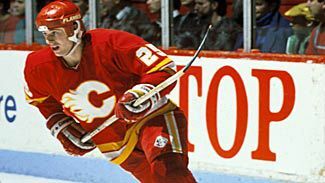 "He was my youth hockey coach for 12 years," Nieuwendyk said. "He kept it fun for the kids. He was the one that had an impact on me." Gilmour said his father, Don, was his favorite coach because he was both tough and loving to him, teaching him that hard work matters just as much as talent. Howe referred to Carl Lindstrom, who coached him when he was playing for the Jr. Red Wings. "He told me I think you're going to be a great defenseman in the NHL," Howe said. "I thought he was off his rocker." 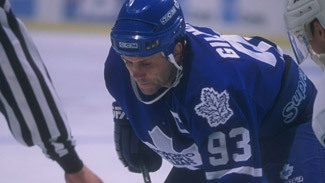 Belfour said his favorite was Gino Gasparini, who coached him at the University of North Dakota for the 1986-87 season. Belfour turned pro after that season, but he still hasn't forgotten the impact Gasparini had on him. "I was only there one year, but I learned a lot of positive stuff from him, how to be a professional," Belfour said. This is a question for Joe and Ed: When Brett Hull scored that goal against Buffalo to win the Cup in 1999, what were you thinking? Hull's Cup-clinching goal is of course one of the most debatable goals in NHL history. Did he commit a crease violation or did he not? The NHL said he did not, but fans in Buffalo still argue that point to this day. "We were at the end of our rope. I'm not so sure we could have matched their team in Game 7," Nieuwendyk said. "So, when that went in we just had to end that game. We all went out there and before they could even review it we were gloves off, helmets off. We didn't want to go any longer. We knew there would probably be a question about it, but we didn't care. We just started our celebration. They couldn't resume the game at that point." Added Belfour: "I saw the arms go up and I'm still looking, 'Did it really go in? Did we just win?' The next thing you know Matty (Richard Matvichuk) was skating toward me with his arms in the air, big hugs all over the ice. It was just a great feeling, unbelievable." And one more from Nieuwendyk: "When we went into Buffalo the next year we knew what we were heading into. There were signs everywhere, 'No goal, No goal.' People were pounding on the glass screaming. "Well, we do the 2-on-1s in warm-ups and you line up along the glass. Mike Keane wore his Stanley Cup ring under his glove and showed all the fans." Mark Howe grew up in the same house as Gordie Howe, a pretty good role model in his own right. But, to Mark and his brother Marty, Gordie was simply just dad. "The guy who I idolized the most as a young boy was actually Bobby Hull," Howe said. "Bobby used to let me in the locker room and I'd be the stick boy. Every time they came into town Bobby used to bring me a half-dozen sticks. The goaltenders of the teams I was playing on at the time hated it. 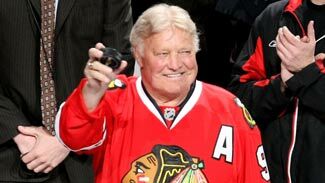 Watching Bobby Hull play everyday was an incredible site, and he treated me like a god when I was a young boy." Belfour also answered Bobby Hull. "When I was 10 years old, we had a tournament in Carmen (Manitoba) and Bobby was playing in Winnipeg at the time. He had these golden jet pucks with his picture and signature on them. He brought all these pucks to the tournament and signed all the pucks for all the kids. He was just loving it. He had a smile on his face and just treated all the kids first class. I never forgot that." Nieuwendyk, who grew up a Leafs fan, said his favorite was Borje Salming. Gilmour, who played defense when he was a kid, idolized Bobby Orr. "I wore No. 4 and Gilmour rhymed with Orr," Gilmour said.